For six years, the brooding former funeral home on Magazine Street that served for nearly a decade as a recording studio for musician Trent Reznor has sat vacant. Now, its new owners are taking the first steps to give it new life as a mix of office and retail space, but are hampered by one of the most common obstacles to development in Uptown New Orleans: parking. Called “Nothing Studios” during its tenure serving Nine Inch Nails and their labelmates, Reznor abandoned the building in 2004 when he moved away from New Orleans. Hurricane damage was minimal, but it remained unused until Feburary of 2010, when it was purchased by Metairie-based cosmetic surgeon Kamran Khoobehi for $900,000 from “Hot Snakes LLC” of Cleveland, its owner since 1995, property records show. On Monday, Khoobehi’s wife, Jila, appeared before the Board of Zoning Adjustments to request permission to redevelop the building with only 16 available parking spaces, compared to the 59 that would technically be required for a building of its size. The plan, Khoobehi said, is to keep the two existing upstairs apartments on the Uptown end, convert the upstairs of the downtown side of the building into her husband’s office, and redevelop the first floor into retail space, though they have not begun recruiting tenants. Because the building has 13 spaces grandfathered in, a waiver for 30 spaces is required. Much of the parking the building would provide is in a lot just across Jena Street that the Khoobehis own, but that nearby Courtyard Grill is currently using. In fact, the Courtyard Grill (which the Khoobehis also have partial ownership of) has a good-neighbor agreement with the surrounding neighborhood reserving use of the lot for the restaurant, an entanglement that zoning board member Robert Steeg found problematic. The shops the Khoobehis envision would mostly be open during the day, so they wouldn’t conflict with the restaurant traffic in the evening, Jila Khoobehi told the board. The board instructed her to revisit the restaurant’s good-neighbor agreement, however, so that the neighborhood is aware of the changes to the parking situation, and voted to defer its decision on her request until next month’s meeting. 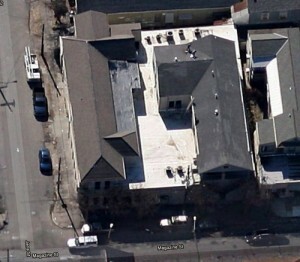 An aerial view of the former building, via Google Maps. On Monday afternoon and again on Wednesday, on-street parking was readily available on Magazine along Laurence Square park and directly in front of the Khoobehi’s building, along Jena Street, and in the lot the Khoobehis own. Surrounded by a chain link fence and only accessible via an entrance the one-way side street, the lot mostly stays empty, said Katie White, a bartender across the street at Buddha Belly. In general, parking in the block tends to be easy during the day, but harder at night, White said. 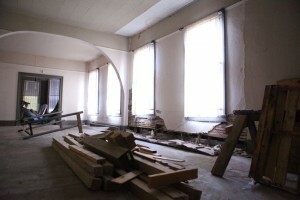 The building itself has been almost entirely stripped inside. All of the electronics have been removed from the actual recording area, though the room retains heavy carpeting that mutes footfalls and dense soundproofing in the walls. Those improvements will remain after redevelopment, Khoobehi said during a tour of the structure Monday afternoon, because such a space could be valuable to a future tenant. 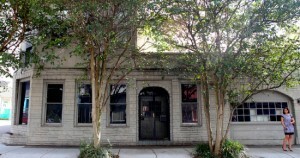 The building also still has the outside door that Reznor brought with him to New Orleans, a macabre memento of his previous recording studio in the Tate mansion where the Manson family murders took place. Otherwise, Nothing Studios bears few physical reminders of its previous occupancy, a discarded exercise machine in one room, a stack of old lockers in another. Khoobehi says that when her family bought the building, her children eagerly searched it for mementos, but found nothing. Outside, the building’s exterior is beginning to crack, a sign of the neglect Khoobehi said she is eager to reverse. Photos by Sabree Hill; article by Robert Morris. Contact us at sabreehill@NolaMessenger.com and rmorris@NolaMessenger.com, or post your comment below. SO crazy that a few parking spots would potentially stop this prime spot from being developed. Magazine St. is doing so well, and has become such a quality of life blessing for the neighbors (I live on Magazine). This place has been empty for six years. I really hope they get the waiver and a few NIMBY neighbors don’t wreck it for all of us. With the economy as weak as it is, it is crazy to stop locally owned businesses from doing their thing, and pushing them out to the soulless burbs to bless JP instead. The burbs of JP actually house the “souls” of many Orleans residents who chose to leave because they actually want to see their tax dollars being returned somehow, because it’s safer, and to get away from the attitudes like yourself that somehow you’re more soulful! I support the local economy, across parish lines and despise comments that incinuate Orleans is better, they have a long way to go. How old is this building and what was it originally? Oh come on. This location has some of the best transit access in the city. It has a HUGE walkshed. The sidewalks just got repaired. You know what happens when you provide 50+ parking spaces? People drive, and there’s traffic. Don’t provide the parking spaces and people will use alternatives. Mandatory minimums for parking are absolutely killing this city. Magazine Street between Napoleon and Jefferson continues to improve and this development would be another prime example. Hopefully the elected officials, citizens, neighbors, neighborhood associations and surrounding businesses agree that allowing this site for re-development is ideal to the city (i.e. tax revenues, jobs, etc.). Please STOP making decisions based on the automobile! Our development decisions should not revolve around the automobile. Progress! Live and let build! This city needs more progressive thinkers. Amen. We should let urban density inspire creative transportation solutions (and maybe some lifestyle changes) — NOT allow it to hamper business development. Density and walkability should be celebrated, not demonized. Magazine Street is a crappy street to drive on cause it is so narrow and busy. BUT, Magazine is the BEST street to walk on. I live in this area, walk by it all the time on the way to NY Pizza, Monas, the playground and the library. I would love to see something for kids there like ice cream, bookstore or snack stop. So, who cares about the parking issues? Not me. Probably the ppl that are driving from Metairie. Parking spaces? Hell, I don’t even have a parking space where I live on Magazine. It’s not a drivers’ paradise, that’s for sure, but neither is the rest of the city. It’s still a lot easier to find parking in our neighborhood than it is in the Quarter. The “owners” need to fix up the property they purchased and not toss out “blight” as a threat to getting what they want! My grandfather was buried from that building when it was a funeral home. We parked our car across Jena Street in the parking lot that is now reserved for the restaurant. Simply said, there’s not enough parking in the area for the property owners, most of whom do not have off street parking. They are the ones who will feel the brundt of the parking situation. You cannot expect people to purchase a property and “Fix it up” and then be left with no ability to use it. There are too many empty blighted properties as it is and few people who can afford to purchase and much less restore them. It’s really not that hard to park around Magazine; the side streets are usually easy. I think the city needs to ease up on all these parking requirements. Parking lots are ugly anyway. Congratulations to the Khoobehis and best wishes for their use of the property. The Khoobehis should be encouraged by the City. This is exactly best the type of project for the location.New Urbanism and infill development shouldnt be subject to suburban parking regs. The new zoning ordinance will not have these hefty parking requirements, which were written into the zoning ordinance in the 70s when City Hall envisioned lots of demolitions and suburban style new construction. For now, unfortunately, property owners have to go through the waiver process.